The Jackets had six players taken in the 2014 MLB Draft and five have signed contracts to play professionally. Four of the six players are pitchers, one outfielder, and one infielder. That makes a total of 13 total draft picks from Tech in the last two seasons, but only 12 different players as pitcher Matthew Grimes was drafted in 2013 as well, but opted to stay at Tech for an extra season. The first Yellow Jacket taken in 2014 was left handed sophomore pitcher Sam Clay. The Minnesota Twins selected Clay in the fourth round with the 10 overall pick. Clay was the 83 player in Tech history to be drafted in the top ten rounds of the draft. 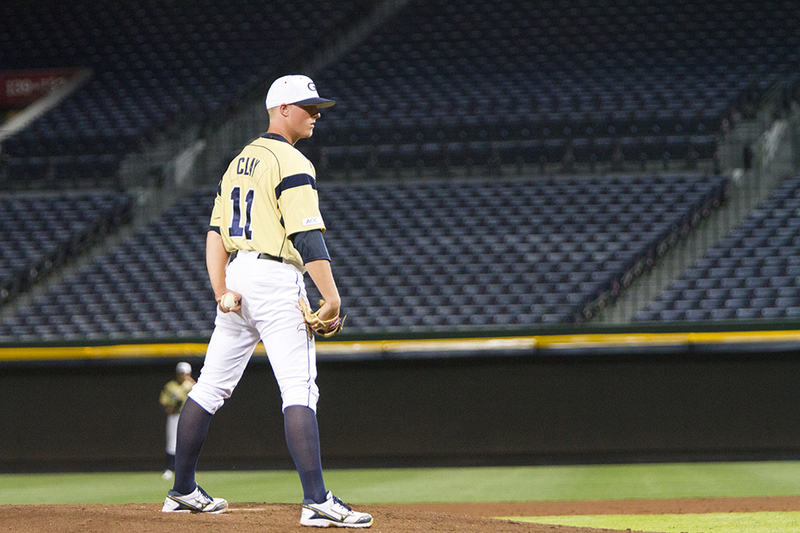 Clay led the Jackets with a 1.26 ERA and an opponent’s batting average of just .197 in 2014. Clay made 31 appearances on the season, allowing just eight runs in 57 innings pitched. In terms of statistics, Clay’s two seasons as a Jacket were polar opposites. In 2013, Clay gave up 18 earned runs in just 23.1 innings pitched for an ERA of 6.94. Clay could have returned to Tech with two years of eligibility remaining, but elected to sign instead. Clay will begin his professional career with the Elizabethan Twins, the rookie ball team of the Minnesota Twins. The second Tech player drafted was junior pitcher Josh Heddinger. The Detroit Tigers drafted him in the 14 round with 430 overall pick. Heddinger had a 4-5 record for the jackets in 2014 in 16 appearances (14 starts). This is the second straight year the Tigers have taken a right-handed pitcher from Tech. In the 2013 Draft the Tigers selected Buck Farmer in the fifth round. Two more right handed pitchers were taken in the 18 round–Dusty Isaacs was selected by the Toronto Blue Jays with the 534 overall pick and the Baltimore Orioles selected Matthew Grimes just seven picks later at 541 overall. Isaacs had an 8-5 record with 1.92 ERA in 29 appearances while Grimes posted a 5-3 record with a 4.39 ERA. Isaacs was drafted out of high school by the Pittsburgh Pirates, but enrolled at tech instead. Isaacs is the 33 player under Head Coach Danny Hall to improve his draft position by electing to play for Tech instead of signing out of high school. Grimes had been drafted two other times–in the fourth round of the 2010 draft by the Chicago White Sox and in the 31 round by the Philadelphia Phillies last year, even coming off a season in which Grimes missed recovering from Tommy John surgery. The two other players selected were junior outfielder Daniel Spingola and senior second baseman Mott Hyde. The Chicago Cubs selected Spingola in the 24 round and the Houston Astros selected Hyde in the 26 round. Spingola led the team with a .319 batting average and was second on the team with 35 RBIs. He is the lone Tech player drafted yet to sign. The four teams who have selected the most yellow Jackets over the years–the Braves, Dodgers, Red Sox and Indians–failed to Tech a single one in this draft. Heddinger had established himself in the weekend rotation last season and Grimes made several weekend starts. With both deciding to sign professionally, Tech will return Devin Stanton, who made 12 total starts last season, and Ben Parr who made a total of ten. Tech will also have Jonathan King and Cole Pitts, who were both in the weekend rotation at the beginning of the season, returning after miss the majority of the 2014 season due to injury. To replace Hyde at second base, Tech could move Thomas Smith back over from first base back to second, and then put designated hitter A.J. Murray back in the field at first base. Shortstop Elliot Barzilli is another midfielder on the team who as experience after playing in 34 games last season.